Charity, Unity and Fraternity are the First Three Degrees of the Knights of Columbus. There are four "Degrees" of Knighthood within the Knights of Columbus. The initiation ceremonies, which are also called "Degrees", are the only facets of the Order which are not made known to non-members. Each of the Degrees is designed to exemplify one of the four Principles of the Order: Charity, Unity, Fraternity and Patriotism. Each applicant must take the First Degree, also called the Membership Degree, before he can be considered a Member of the Knights of Columbus. Once he has taken his First Degree, he becomes a member in good standing in the Order. To reach full Knighthood, members must also take the Second and Third Degrees, and all members are strongly encouraged to do so. Once a man has been a member of the Knights of Columbus for a year and has taken his Third Degree, he is eligible to join a Fourth Degree Assembly. The Fourth Degree has its own structure separate from that of the Council. Click here to get more information on the Bishop Joseph A. Durick Fourth Degree Assembly at St. Patrick. The Emblem of the order dates from the Second Supreme meeting, May 12, 1883, when it was designed by James T. Mullen, who was then the first Supreme Knight. A quick glance at the emblem indicates a shield mounted upon the cross of Malta. The Shield is that associated with a medieval Knight. The Cross of Malta is the representation of a traditionally artistic design of the Cross of Christ through which all graces of redemption were procured for mankind. This then, represents the Catholic spirit of the Order. Mounted on the shield are three objects, a Mace standing vertically, and, crossed behind it, an Anchor and a Dagger or short sword. The Mace from Roman days is symbolic of authority, which must exist in any tightly bonded and efficiently operating organization. The Anchor is the mariner's symbol for Columbus, patron of the Order, while the short Sword or dagger was the weapon of the Knight when engaged upon an errand of mercy. Thus, the Shield expresses Catholic Knighthood in organized merciful action and with the letters K of C, it proclaims this specific form of activity. The red, white and blue in the background are the colors of the flag of the country in which the order originated. Red is the symbol of Faith, of belief in Christ, in the Redemption and in the mission of every man to spread the knowledge and love of Jesus Christ. White is the color of the Eucharistic Host, symbolizing God's presence among men and of the infinite love God has for man. White is then the symbol of Christ-like Charity. Blue is the color of Our Lady's mantle in which she draped her beloved Son, through Whom salvation came to a sinful world. Blue is then the symbol of Hope. 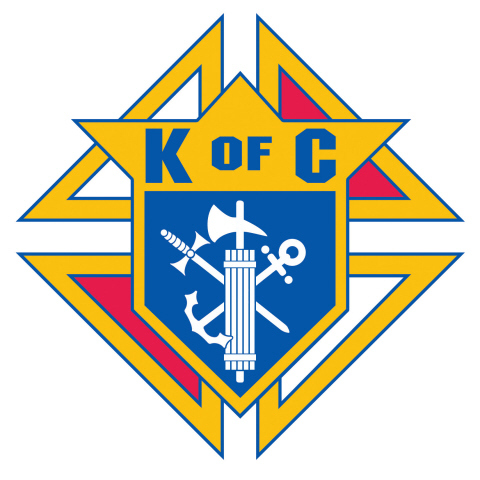 All members of the Knights of Columbus belong to a particular Council, and any group of at least thirty men may apply to found a new Council in their area. Our Knights at St. Patrick belong to St. Patrick Council 10567, which meets on the first Thursday of every month. The highest elected officer of each Council is the Grand Knight, who, with the other Council Officers, is elected by the membership each year. The current Grand Knight for Council 10567 is James Nelson. The Grand Knight appoints various Program Directors and Chairmen to run the Council's activities for the year. With the exception of Membership activities, all Council activities fall into one of five Program Areas, each with a Director. The five Directors of Church Activities, Community Activities, Council Activities, Family Activities and Youth Activities report to a Programs Director. Several Councils within the same geographic area are grouped together in a District under the guidance of the District Deputy and his assistant, the District Warden. District Deputy for Council 10567 is Larry Cannon. The District Officers are appointed by the State Deputy, the highest elected officer of the State Council. The current Alabama State Deputy is Griffin Shreves. State Officers and Program Chairmen are analogous to those at the Council level and coordinate the activities of all the Councils throughout the State. Each Spring, the State Deputy hosts a Convention to elect officers and conduct other State business. Every Grand Knight and one elected Delegate represent every Council in the state at this Convention. The highest level within the Knights of Columbus is the Supreme Council, headed by the Supreme Knight. At the Supreme Convention each summer, State Deputies and Representatives from each State, Territory, or Country meet to conduct business concerning the international operation of the Order. The Knights of Columbus Flag combines in its field red and white colors from the emblem of the Order, yellow from the papal flag and white and green from the expeditionary flag of Columbus. A broad band of yellow and a narrow band of red, in parallel, divide the flag diagonally from lower left to upper right corners. The triangular white upper field features the green cross of the ensign flown by Christopher Columbus on his voyages of discovery. On the triangular blue lower field is the emblem of the Knights of Columbus.